Waiting for the release of this sequel felt like forever, but it was really just three months, but hey, can you blame me?! 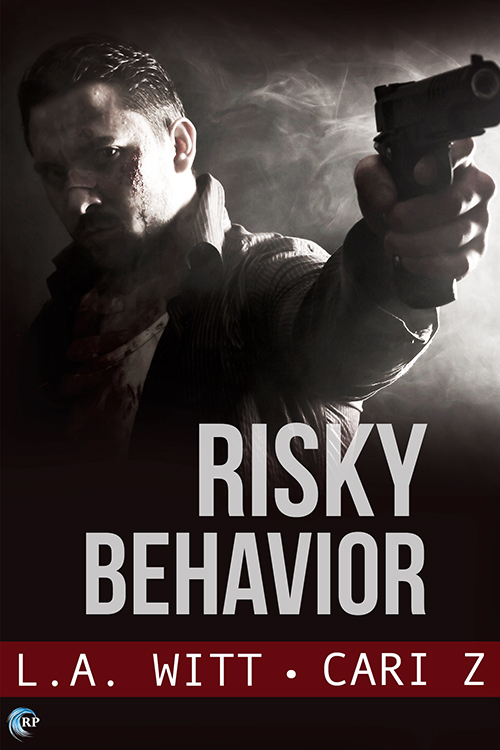 After amazing debut of the writing partnership of L.A. Witt and Cari Z via the Bad Behavior series starter Risky Behavior, I was antsy about seeing what was up next for the dynamic duo of Andreas Ruffner and Darren Corliss, both detectives who formed an unlikely partnership inside and outside of the precinct. Now, it must be noted that I went totally nutty for book one, so expectations for this second one were at impossibly high. Remember, these are two of my favorite M/M authors and they knocked me for a loop with their first foray. Did I want them to do the same here? Hell yes, I did. So...did they? Hell yes, they did! 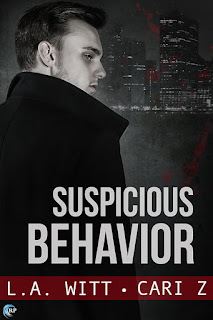 Suspicious Behavior stupendous! A few weeks after the events in the first book, we catch up with Andreas and Darren, with the former doing better with his new medication cocktail for his HIV status and the latter slowly but surely healing after getting stabbed. They're being treated like persona non grata by many a cop, looked upon as nothing more than snitches after the discovery they made of graft and corruption in the mayor's office and in the police department. Now, they've been handed several cold cases to look through--cases that may be connected. Andreas and Darren will have to work quickly to find their suspect and make an arrest before more lives are taken. But with Darren's brother's worsening condition and Andreas's own family issues, distracted detectives could spell the difference between life and death. I loved that fine balance between the romance and mystery suspense aspects of this story, both of which go hand-in-hand because the latter does affect the former and vice-versa, though to a lesser degree. Figuring out how all the cold cases they were given may have been the one easy thing that Andreas and Darren had to contend with in this story because everything else was on the opposite side of the spectrum. First the mystery part, which was hands down a thrill to figure out. You see, I had a feeling who the bad guy was but what was stumping me was why the hell they were doing what they were doing. What could have motivated them to have killed so many people and to do it they way they did? Without a doubt, this had one of the best mysteries in any book I've read this year. As for the romance, can I just say how much I loved how solidified Andreas and Darren's relationship had become by the end of the book? While Darren knew about Andreas's HIV-positive status in the first book and chose to pursue a relationship with him regardless of it, the shoe was on the other foot here, what with the very real possibility that Darren could very well have the same gene that caused his older brother Asher's early onset Alzheimer's. Do you stay in a relationship even though the person that you're falling in love with may not remember you or your history together sometime in the far (or near) future? There's also Darren's complicated family ties with his children and exes, but a quick peek at book three's blurb shows we'll get more on that in 2018. Learn more about L.A. Witt and Cari Z. Purchase Suspicious Behavior on Riptide Publishing | Amazon | B&N | iBooks | Kobo.